Our innovative social media automation dashboard provides everything you need to quickly create and easily manage an engaging, compliance-friendly social media presence. Post fresh content every day without lifting a finger... and it’s all compliance-friendly. 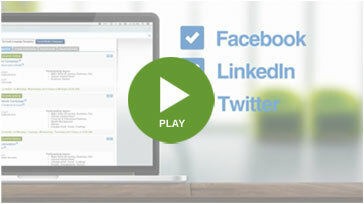 By adding Social Media Automation to your MarketingPro account, you'll be able to take your social media presence to the next level in record time. Easily link your various social media accounts (Facebook, LinkedIn, Twitter), then create automated social campaigns by selecting what types of messages you'd like to post, where, when, and how often. The system offers a minimum of 10 new text-based social media posts each week, and 15 or more new social media images every month. Stay ‘top-of-mind’ in record time. Automating your Social Media campaigns allows you to stay 'socially active' without spending your entire week online. 45% of online US adults who have a Twitter account are interested in interacting with financial services firms. 3 out of 4 financial professionals now use social media for business-related purposes. 74% of affluent people aged 55-70 have one or more social media profiles (avg. income $249k).